On February 3, 1959, a small plane crashed in a corn field in Iowa, killing three rock and roll stars - Buddy Holly, Ritchie Valens and J.P. Richardson, known as "The Big Bopper". The 50th anniversary of that tragic event is being observed by rock fans around the world, but especially in Clear Lake, Iowa - the scene of their last performance, where a large concert is planned, and in Buddy Holly's hometown of Lubbock, Texas. Charles Hardin Holly, known to his family and friends as Buddy, was only 22 years old when he died, but he had by that time created a guitar-driven rock and roll style that would live on among rock bands around the world. In only a few years, the Lubbock native created hit songs that are still played today - classics like "That'll be the Day," inspired by a line John Wayne spoke in the western movie "The Searchers". Holly rocked his fans with songs like "Peggy Sue" and "Maybe Baby" and then soothed them with ballads like "Everyday". The song marked the first use in pop music of a celesta - an instrument mainly associated with classical music performances. Holly's style and musical experimentation appealed to many up-and-coming musicians, especially in Britain, where he has many fans even among people born long after his death. Among the British visitors to Lubbock for the 50th anniversary of Holly's death are Phil and Caroline Jenkins. "The Beatles and the Rolling Stones - they all credit Buddy as being a major influence," Jenkins said. "It seems that you get more in England than you do here. He is bigger there than he is here. You know, he is bigger there than he is here. Lots of people here we talk to go, 'Who?' They don't know the name." Jessica Camacho helps run the Buddy Holly Center in Lubbock, which is holding panel discussions and special events to commemorate Holly's death. Camacho is only 26 years old, but she says she recognizes the importance of Holly - not only to her hometown, but also to the world of music. "I don't know how many younger people realize what kind of influence Buddy Holly had even on the music that they hear today that they love. I think his influence was far reaching," Camacho said. 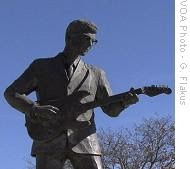 There are still many people living here in Lubbock who knew Buddy Holly well. Among them is former musician and disc jockey Jack Neal, who was Buddy Holly's first musical partner on a local radio show. He sat in on jam sessions with Holly and a young rock singer from Memphis, Tennessee named Elvis Presley, just months before Elvis went on to become a legend himself. "I truly believe that if Buddy had still been living, he would have been as big as Elvis, if not bigger, because of the two different styles of people that they were," Neal said. Neal knew Buddy Holly as a close friend as well as an artist, and he misses him still. He recalls one of his last conversations with him, not long before he died. "He was in town and we were at one of the drive-ins and it was just before he left to go on that last tour and he said he wanted people to know Buddy Holly," Neal recalled. "He wanted them to know the name. He said the money was nice, but he wanted people to know the name. And so that was his goal and that is exactly what he did." The fatal plane crash in Iowa was commemorated in 1973 by singer/songwriter Don McLean in his hit song, "American Pie," which spoke of "the day the music died." But most Buddy Holly fans say his music never died and that it lives on in the rock and roll he helped create.